What an honest, thoughtful post. As a 2nd grade teacher, I really feel for you and Graham. My heart breaks for him that he doesn’t get to feel safe and respected at school. Of course you don’t feel like a good mother all the time, that is impossible, but Graham is SO lucky that he has you and Randy advocating for him and responding to his needs. Thank you for being so honest about your struggles with him. You are such a great mother and one of the best out of those whose children I babysat for in Seattle. I love you all so dearly. You are a good mother, Dana…you are, you are, you are. See you in 2013 in San Fran. I can feel it will happen. Tell Graham I said hello and happy birthday. Hi there, I am not a commenter here often, but I am an often reader. I love your funny story at the end, it rang true for my family too! My brother is delayed as well and one funny thing is that as the older sibling my Mom held true and never bribed me for grades, chores, anything. With my younger brother she has found that sometimes it is the the easiest path with the least amount of yelling possible. ha! She has used everything from money to dinners at his favorite restaurant to a trip through the drive though for a milkshake. :) Thanks for sharing your story so candidly. I hope you find a community soon here of parents, hopefully some of whom are going through things similar to you. I sure adore your boy. Just like you say, I’ve always thought of him as sweet to the core. I really miss seeing his precious smiles. Whenever I see our plastic golf clubs, I think of him. Anyways, thank you for sharing the truth of your experience. Your honesty is so beautiful. I hope he’s not the only one getting the support he needs & you feel supported, too. Cheering you all on while you’re on this journey. Wishing I could put a bubble around him with those teasing kids. Glad you two are fighting so hard for him. Aw… He is just perfect! I am reminded of an NPR interview I heard this week. The author wrote “far from the tree” I believe. I was planning on getting it for myself. 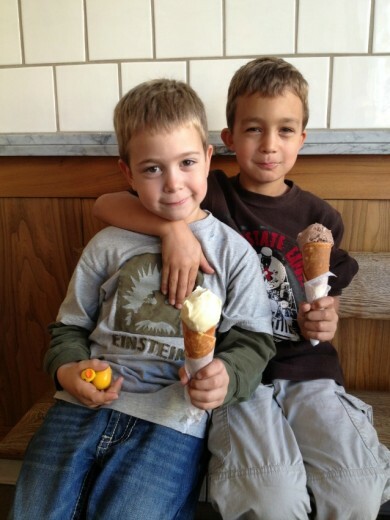 Love the pics of the birthday boy and his favorite brother eating some of the best ice cream in Berkeley (you all need to go check out Sketch on 4th Street too). Reading this post reminded me of our conversation over lunch — you write just like you speak, Dana. I so admire your honesty, calm, kindness, compassion, and fierce mama love for this gorgeous little boy. And the younger brother’s brilliant idea to bribe his older sibling into standing: priceless. Oh Dana, as someone who has met and adores Graham, I can honestly say that he is one of the sweetest boys I have ever met. And I feel your pain about the school situation. It seems like you’re doing all that can be done by getting him some social therapy and I really think and hope they will start to pay off soon! Thanks for always speaking the truth so eloquently. You are a wonderful mother. I have to go re-do my makeup now after reading your post! Your story caught my eye, we are long time friends of the VW family. I have an 8th grade boy who years ago in first grade befriended a boy with similar qualities to your son. We all became friends and have remained since. They went through testing, only to find tendencies, but nothing solid. An IEP over the years, the forgetfulness, social issues, etc. They have done what you plan to do with social class help and extra patience- which she has often felt guilty about her lapses. He too is the oldest of two boys with the younger not needing extra help. As I read your post, I remember all the conversations and concerns she has had for her boy- particularly how he would be excepted by his peers. There have been ups and downs for their family- but as he has grown with the support of his family and outside support- her concerns have lessened and her concerns are more like any mom of a teenage boy. Happy Birthday, Graham! Scott and I still talk about how amazing he was to hang out with the day we met you in Seattle. He is an excellent kid! And you are giving him everything he needs to grow and thrive; you’re a wonderful mom. Dana, I cried reading this. We went through similar struggles with our sweet boy last year, when he was in kindergarden and luckily we were able to get a “diagnosis” which pointed us in the direction of therapies that would be beneficial and have been beneficial to him. And his teachers (last year and this year) have been wonderful in helping the other children understand his differences and why he has things like his chewy at school which has helped with the teasing/bullying. And his school has been proactive and set up the classes with the children’s interactions in mind to bring out the best in everyone. But everytime we start a new activity or meet new people I always wonder, how much do I explain? Do I ever go down that road and possibly influence them to think badly of my boy from the start and just let him be his own funny self and if they have questions, they can ask. Your situation has meant this has come up for you much more frequently than it would otherwise. I hope you can work with teachers and the school to find what works for Graham. Your lad has accomplished so much and he seems so sweet from pictures and stories you tell of him. I laughed at the Spencer suggestion. 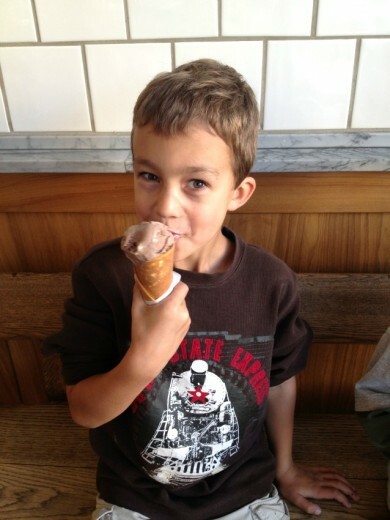 (Bribery is the only thing that works with our kid as well.) Happy Birthday to your 8 year old. I just wanted you to know that you are the perfect mother for your son. Human. Loving. Never giving up. Wanting the best for your boy. He has the best. You. I want you to know that this was an amazing post; you are so incredible and such a wonderful mother. Your boys are beautiful and you have done such an amazing job with them. I am sending you HUGE hugs from NYC as I miss you dearly and I truly hope you have a great holiday season. Love you lots; thank you for this amazing post and for being so strong- you are an inspiration. As a long time reader of your blog, I want to thank you for writing your personal thoughts on this site. So many blogs are personal, or food/craft based, but we are lucky to have you, which is a honest look at both. That said, I don’t know you or your family, but I want to reach out and hug each and every one of you! All of us, with boys (and girls) that may be just slightly (or more so) “different” from their peers, suffer from minutes, hours, days of worry, guilt, love, pride, and frequently a mixture of all of the above. Sorry for the long windiness, but I want you to know that Graham will find peers that love and accept him, too. We just have to keep looking and finding them and that amazing teacher who made a difference. this broke my heart! it kills me to think of any child being left out or ridiculed by other children. that is something i talk to my girls about A LOT– understanding that everyone is different and what a boring place the world would be if it wasn’t that way, sticking up for others even when their friends aren’t, being friends with EVERYONE. i am really proud of them so far and i can only hope that will stick with them for life. and what a lucky boy Graham is to have such loving parents. that will get him farther in life than anything! I’ve been reading your blog for about a year and always love your recipes and photographs. I’ve never commented, there is something about commenting on blogs that causes me great anxiety. I felt I had to comment today to thank you for your obvious love of your children and your honesty about the challenges of motherhood. Happy birthday to Graham, and thank you again for the food, the photos, and the honesty. I am a longtime reader and a sporadic commenter, but this post was too touching not to say something. I teared up at the end at Spencer’s suggestion. Sounds like you have done an amazing job raising two sweet boys! And as a native Washingtonian turned Bay Area transplant, I wish you all the best in your new lives and know you will love it! I can’t believe he’s already eight years old! Happy Birthday to Graham. Hopefully his new classmates will come to know him better soon. And, good for him to have handled the big move so smoothly. I just came back from 3 wks away. You always touch me with your posts. You are such a nice person and are probably a great mom. Happy Birthday to your son and I wish him that his future will be better. You know, I wish I could say something that would express how touching and amazing reading this post has been. I have no words, just pure, raw admiration. Beautiful. Love this post. I can see in the photos you post of him (here and on IG) what a sweet and spirited child he is. 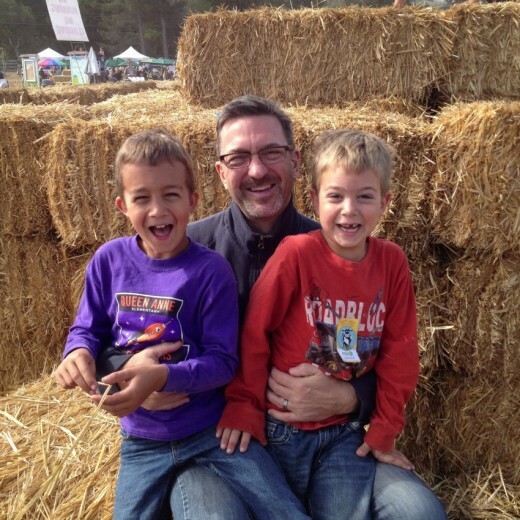 For what it’s worth, my husband was teased as a young child (albeit for different reasons….a speech impediment and a patch over his eye) and he swears it was the best thing that ever happened to him. He actually has said he hopes our children are teased. I can’t say that I HOPE our children get teased, but I can appreciate his perspective. Lots of love to you and sweet Graham!